Recently, Botswana’s spectacular Okavango Delta hailed the historic arrival of six Botswana-bred rhino (four males and two females); brought about by the propagating success of the Khama Rhino Sanctuary (KRS). The KRS was primarily established as a rhino breeding sanctuary to reintroduce these endangered animals to the wild areas of Botswana. 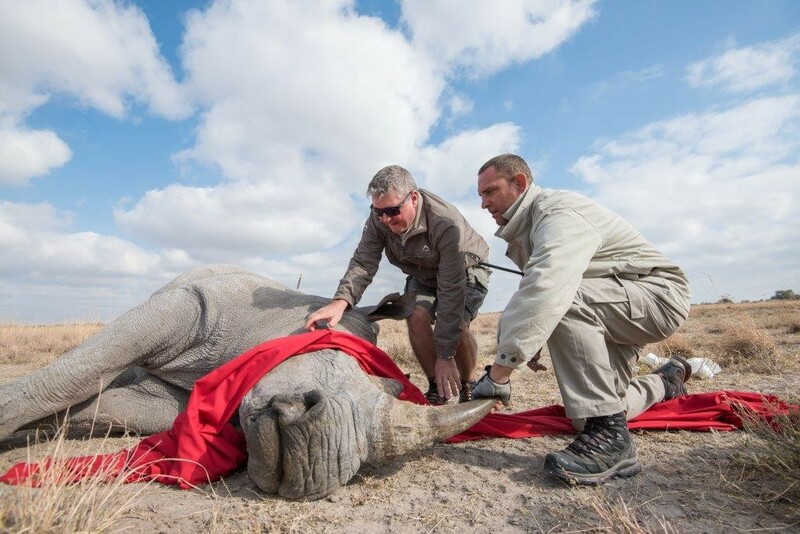 This momentous translocation, achieved through the collaboration between Rhinos Without Borders (an andBeyond and Great Plains Conservation initiative) and Khama Rhino Sanctuary, was a three-fold success. Seven rhino were moved from a private game reserve in South Africa to the sanctuary, which will help to replenish the gene pool at KRS. 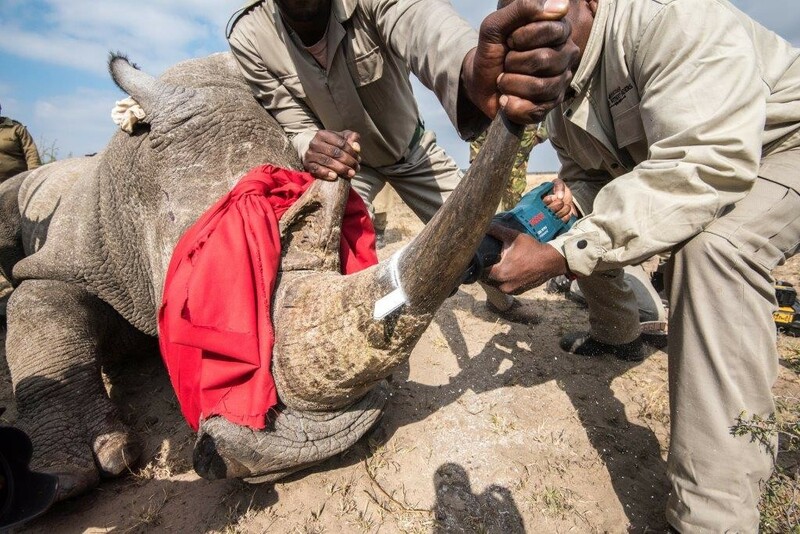 This was then followed by the translocation of the six rhino, bred at the facility, to the Okavango Delta. 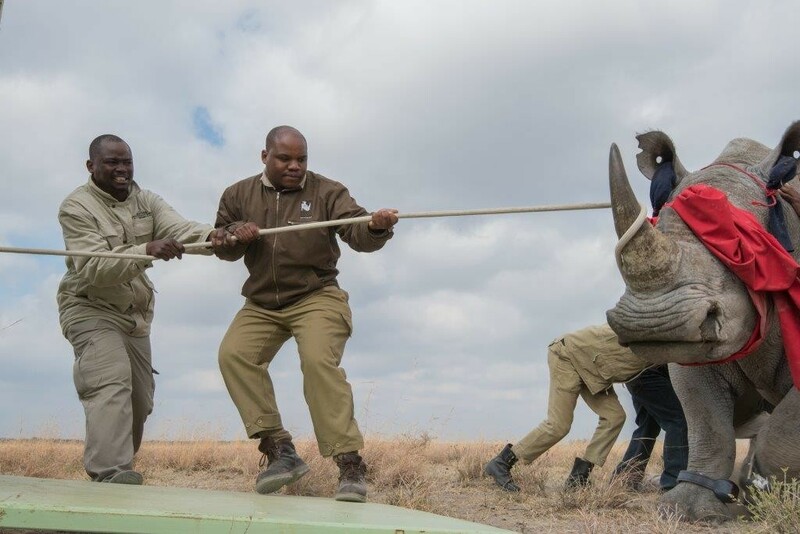 Additionally, the Rhinos Without Borders team took the opportunity to train the KRS crew on translocation practices; ensuring effective, safe and reliable skills are now available to those within the Botswana conservation sector. These rhinos have now joined the 25 already successfully translocated through Rhinos Without Borders, from South Africa to Botswana in 2015. 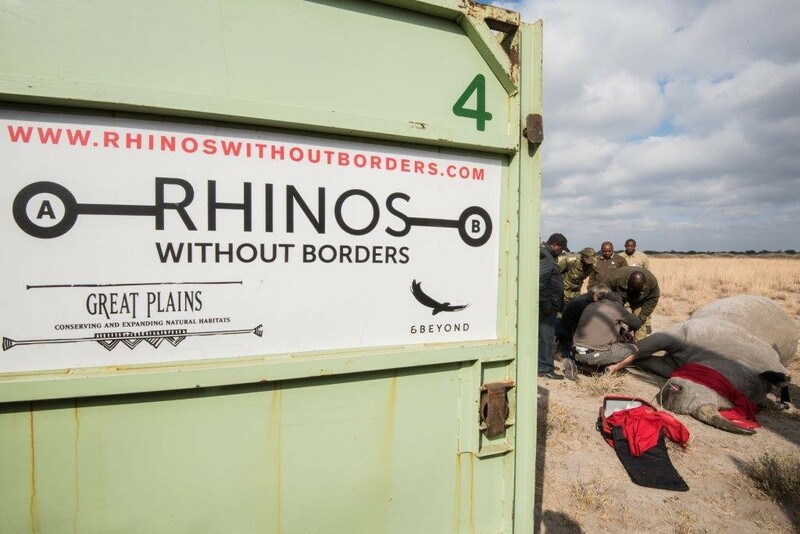 “Rhinos Without Borders has just gotten back from successfully moving six rhinos from the Khama Rhino Sanctuary (KRS) to the Okavango Delta. The mission went off well and the six rhinos were delivered safely. We all arrived at Khama Rhino Sanctuary on Monday, 20 June; at various times from various locations. Two trucks drove down from Maun with two crates and a truck drove up from South Africa with another four crates. Unfortunately, the South African truck had issues at the South African border, so it was delayed by 24 hrs. Luckily, there were other crates at KRS but that restricted us to only catching three rhinos until the South African truck arrived. On the morning of the 21st, we started to search for the six identified animals for the move. At around 10am, the first rhino was spotted (a female) and we moved in to dart it. 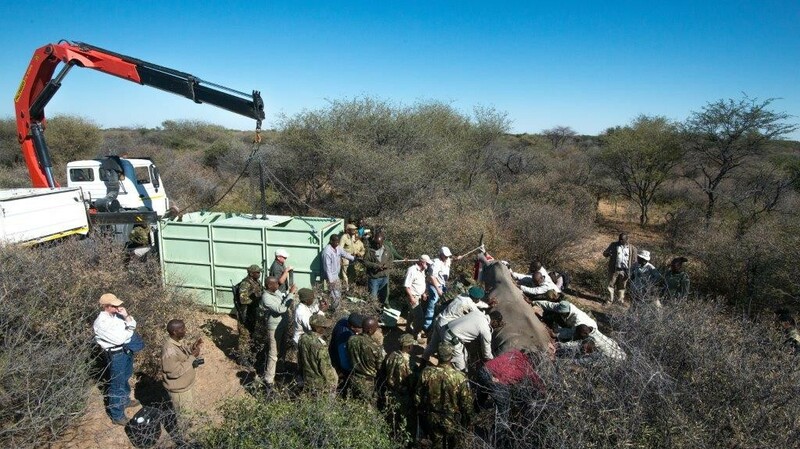 She was placed into a crate, under a tree, to wait for the rest of the rhino to be darted. A bit later, a group was spotted close to an open area. This group included two rhinos (a male and a female) that had been earmarked for the move – both were darted and joined the first female. By the time these animals were all safely crated and loaded it was quite late and not far from when we expected the South African truck to arrive. The truck arrived at around 17h00, which made it too late for us to dart any more rhino that day. Initially we were hopeful to get all six on the 21st, so we could travel back together, but this did not happen. 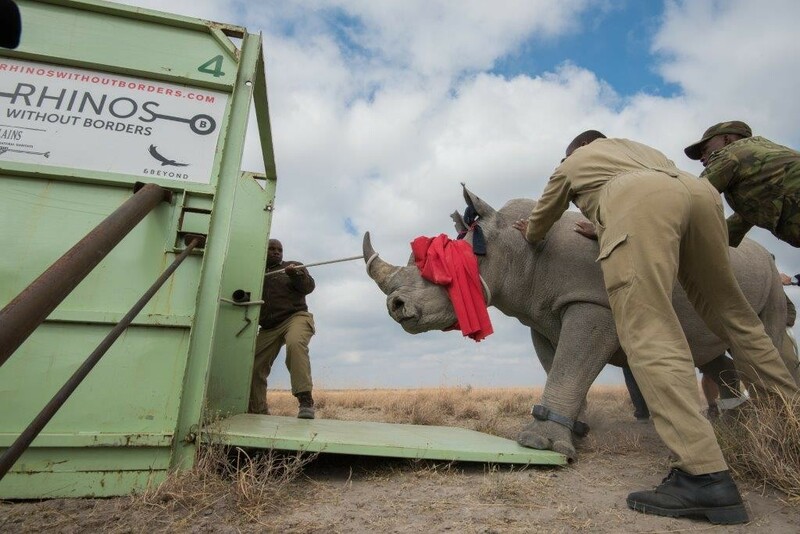 We offloaded the crates from the South African truck and re-loaded it with the three crates containing the rhino and sent them off to their new home. They reached the release site at around 11h00, and off loaded safely. Back at KRS, the rest of the team woke early and searched for the remaining three rhino. At around 09h00 a group of three animals were spotted; fantastically, all three were identified as the rhinos assigned for the move. This group included two males and a female. The first two rhino to be darted were the males. They were loaded into crates, and placed in a nicely shaded area to wait for their female counterpart. As this was all happening, a member of the team was searching for an aggressive rhino bull that was fighting with all the other bulls in the sanctuary. As we were about to leave and dart the last female, our team member called to say he had found the troublemaking bull – an amazing feat as finding one, specific individual in 10 000 hectares, without a tracking device, is a veritable needle in a haystack! Finding the bull put us in a bit of a bind as the KRS staff requested that we take the bull instead of the female. We had to make a decision whether or not we would stick to our original 50/50 ratio, or help remove the instigator from the sanctuary. In the end, we chose the bull – with the KRS staff promising to deliver us the female if we were back in the area. We loaded two crates onto one of the remaining trucks, and the third onto a second truck, leaving KRS at around 14h00 that afternoon. We arrived in the Okavango Delta and safely released the three rhino at around 06h00 the following day. Established in 1992 as a community based wildlife project, whose aim was to restore an area formerly teeming with wildlife, the Khama Rhino Sanctuary now offers 8 585 hectares of pristine wilderness that has become a refuge for black and white rhino as well as over 30 other animal species and more than 230 species of birds. andBeyond is one of the world’s leading luxury experiential travel companies, designing personalised luxury safaris in 15 African countries, as well as arranging bespoke tours in India, Bhutan, Sri Lanka, Nepal, Chile and Argentina. The company also owns and operates 33 extraordinary lodges and camps in Africa and India that positively impact more than 9 million acres of wildlife land. Established in 1991, andBeyond takes exceptional care of its guests in order to make a difference; its commitment to sustainable responsible travel, conservation and community empowerment has been globally recognised with multiple awards over the years. Great Plains Conservation was established to find the right formula of conservation, communities and commerce that would make a lasting, sustainable difference to the world’s iconic wildlife and wilderness areas. Over the years we have witnessed the steady degradation of these natural treasures in spite of considerable efforts to protect them. Our model takes stressed and threatened environments, surrounds them with compassionate protection and intelligent, sustainable management, and funds them with sensitive, low-volume, low-impact, tourism. Communities are an intrinsic part of this model and benefit directly from it. The final piece of the puzzle is our clients and guests – who pay to visit the camps we create, and through doing so, become our valued partners and agents of positive change. Great Plains Conservation is first and foremost a conservation organisation that uses eco-tourism as a tool to sustain conservation programs. Our philosophy is grounded in the fundamental appreciation of the good in life; good people, good staff, good decisions, good things we share and enjoy, but most of all we try to extend that “goodness” to our interactions with guests, with wildlife, with nature and with the local communities which so depend on them.